GARDAÍ REMOVED A small number of protesters from the path of vehicles on their way to a construction site at Green’s Bridge in Kilkenny City today. The group, who are opposed to the construction of a controversial new bridge over the River Nore, physically blocked the path of trucks into and out of the building site at several times this morning and afternoon. Some demonstrators, speaking to TheJournal.ie, said that while members of the Garda Síochána had generally acted to defuse tensions on the scene, they had physically removed two women from the path of the trucks. Gardaí attended the scene of a protest this afternoon at 3.30 pm in Kilkenny. Three protesters were blocking the entrance for a construction vehicle at a construction site at Green’s Bridge. The protest ended peacefully a short time later. No one was arrested, no one was injured, and construction work continued. The spokesperson did not address the question of alleged physical interventions by Gardaí during incidents earlier in the day. Meanwhile, a Facebook group calling itself CAS for Kilkenny has been set up to express strong support for the construction of the bridge, as well as the wider CAS (Central Access Scheme) in the city. One of its members told TheJournal.ie this evening that there was a “silent majority” in Kilkenny who supported the redevelopment. It’s a lethal road for kids cycling to school, and there are numerous near misses each school term. 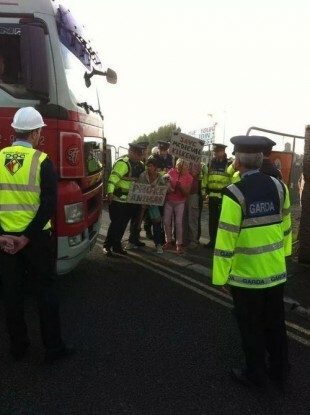 Email “Kilkenny bridge protesters block construction site”. Feedback on “Kilkenny bridge protesters block construction site”.